To use your template to create a new page, just navigate to a page over which you have site administrator privileges and select Add → Page from the Dockbar. You’ll be able to select a page template and type a name for the new page. Alternatively, you can use the Control Panel. First, in the context selector menu, select the site to which you’d like to add a page and then click on the Site Pages link. Then click the Add Page button, type a name, select your template from the drop down menu and click Add Page to finish. Note that by default, when a site administrator creates pages based on a page template, any future changes to the template are automatically propagated to those pages. Site administrators can disable this behavior by unchecking the Automatically apply changes done to the page template box. To export a Site using a Site Template, use the following process: 1. Go to Control Panel → Site Templates and click Actions → Manage Pages for the Site Template your site is using. 2. Click Export to obtain a LAR file with the content of the Site Template. Be sure to choose the applications and data you want exported. 3. In your target environment, go to Control Panel → Site Templates and create a new Site Template. 4. Click Actions → Manage Pages for that Site Template and then click Import. 5. Upload the LAR file containing your site template’s content. For page templates, the process very similar: 1. Go to Control Panel → Page Templates. 2. Next to the page template you would like to export, click Actions → Export. This produces a LAR file you can import later. 3. 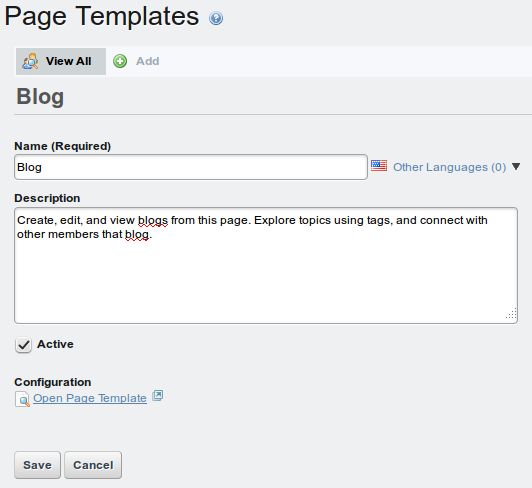 On the target environment, go to Control Panel → Page Templates and create a new Page Template. 4. Next to the new template, click Actions → Import. 5. Upload the LAR file containing the exported page template from step 3.